Time for a brief Costume College recap. I didn't make any new costumes for Costume College this year, and I didn't want to go without costumes, so I brought the three most recent things I've made or acquired. At the Friday Night Social, I wore a 1950s-inspired cocktail dress. I made this for a special occasion in March, and will do a separate post on it later. 1950s-inspired silk cocktail dress, with my best attempt at a '60s bouffant. 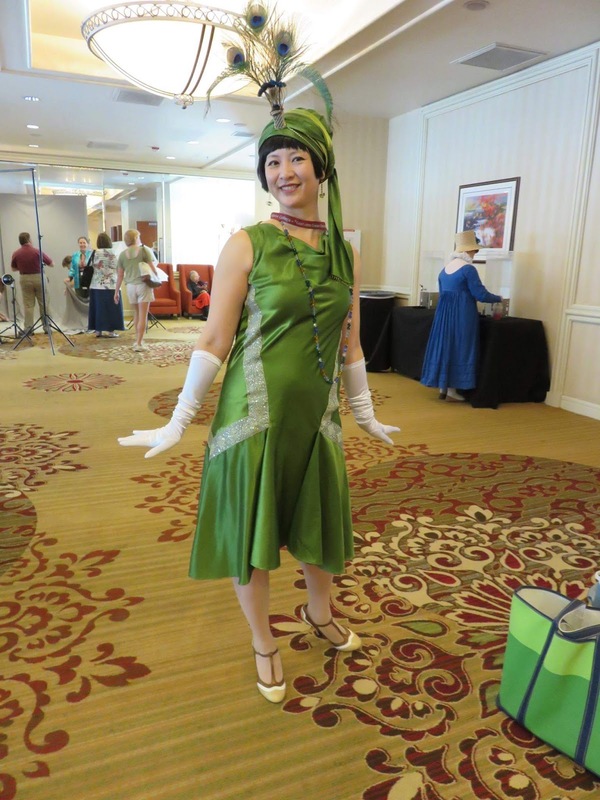 For part of Saturday I wore the 1920s ensemble Lynn McMasters made for her new turban pattern. I'm really lucky that Lynn likes to use me as one of her models. I'm not super fond of having my photo taken, but frankly I'll do anything Lynn asks. 1920s party dress designed and constructed by Lynn McMasters. Photo courtesy of Val Labore. 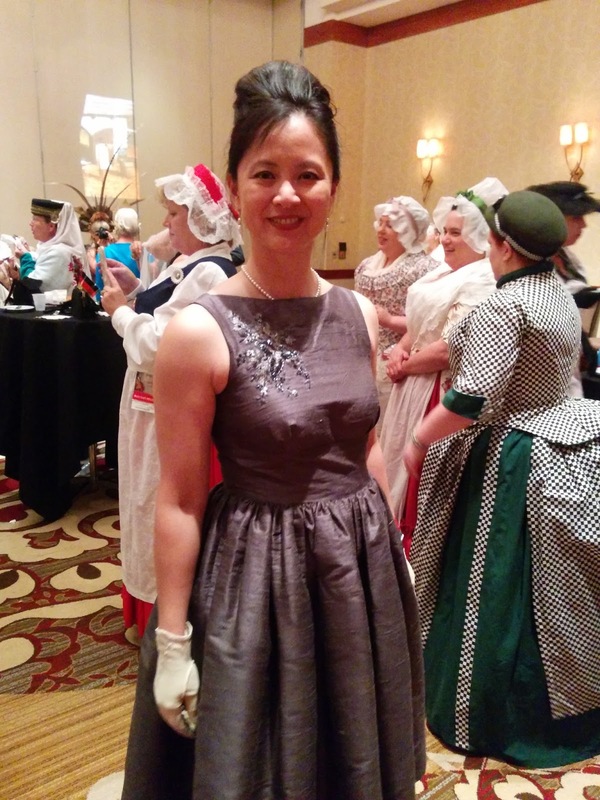 She blogs over at Time Traveling in Costume. Val is funny and creative, go check her out! 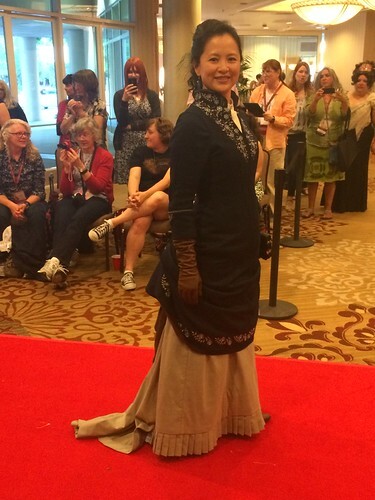 And finally, for the red carpet walk prior to the Gala, I wore the gown I made for the Bustle Tea last year. It has some updates, and deserves a full blog post (which I'll get to sometime soon). Photo courtesy of Noelle Paduan. See more at her Flickr. Other highlights from Costume College include: seeing the ladies from The Tudor Tailor again, for the first time since I attended a workshop with them back in 2007; the always fabulous Cathy Hay; seeing some of the Web's most beautiful and talented costumers in person; lectures with fantastic folks like Jennifer at Historical Sewing, Ithylwyn, Amanda Irwin, Rory Cunningham, Heath Hammond, who I think said he was affiliated with the English Warbow Society, and many others; the goodies I had not meant to buy but that came home with me anyway; and, of course, catching up with everyone in my costuming "family," I love you guys, your talent, and your endless creativity. Jane Malcom-Davies of The Tudor Tailor with your author. 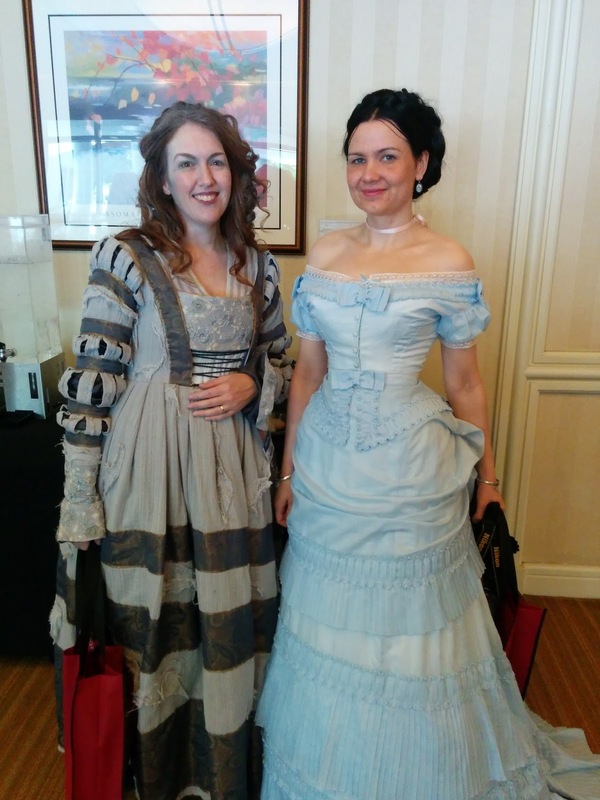 Jennifer of Festive Attyre (as the Grey Lady from Harry Potter) with Merja of Before the Automobile (which has got to be one of the best blog names ever). Goodies from The Tudor Tailor! An autographed copy of "The Tudor Child," a copy of "The King's Servants," a pamphlet titled "'And her black satin gown must be new-bodied': The Twenty-First Century Body in Pursuit of the Holbein Look," and an updated edition of their "gable hood" pattern. All of these, except the pamphlet, can be had from their website. 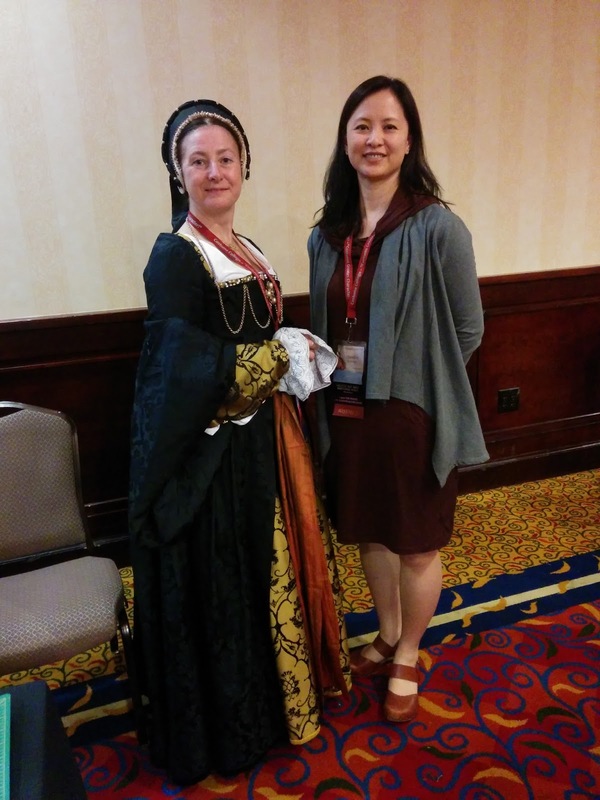 More from The Tudor Tailor! My understanding is that this fan was used by the interpreters at Hampton Court Palace, and before that this was a prop in the movie "Shakespeare in Love." For real. Ray Fiennes may have touched it. And yet more from The Tudor Tailor! I believe the necklace an earrings were used by the interpreters at Hampton Court. The necklace needed a minor repair, so I got it for a steal. The lace is just-to-die-for reproduction Reticella that can also be had from their website. Antique rhinestone parure that I picked up in an antiques shop in Santa Barbara. I don't have a date for this set, and I'd wager a guess that it's no older than the 1950s, but it could pass for Edwardian. Besides, it's blue, it's pretty, and so it's MINE. Oooooh! All of your costumes for Coco are beautiful!! I think my favorite was the 1920s one!! You look fabulous!